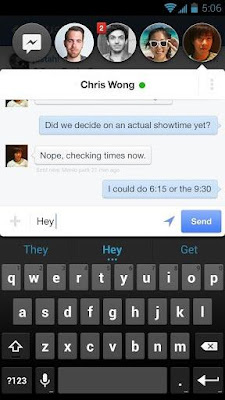 In recent weeks, Facebook made massive headlines for its new Android interface Facebook Home. The openness of the system made it possible for the social network to push its own interface on Android over it. Facebook for iOS also would like to be home offered. However, iOS is a completely closed system which does not provide the opportunities. That's why Zuckerberg said little later in an interview that Facebook needs to speak with Apple and Android integration is much better in the relationship. These discussions seem to take place now. 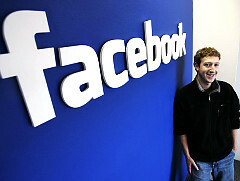 Bloomberg reported that Facebook and Apple negotiate an integration of Facebook home on iOS. According to the Facebook source from Apple representatives have the technology already paraded around home. Both companies were in negotiations and a result is not yet in sight. But what apparently is foreseeable that Home cannot come in the full version on the iPhone or iPad. It will probably run out the fact that only some of the functions and a bit of design in iOS. Facebook developed an alternative lock screen for iOS. It could also be published under a different name. Always Facebook and Apple have a difficult relationship behind. So there was always conflict between the two companies, as an integration of the social network might look like practically in iOS. With iOS 6 for the first time is a deep Facebook integration present in the system, which comes at no extra app needed for. On the occasion of the conference, Facebook unveiled its new social platform. 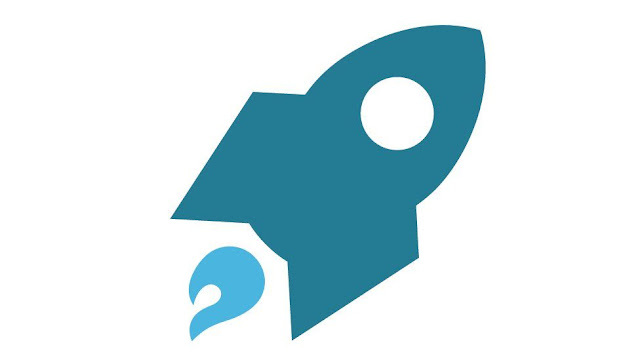 They focus on the ease of access to content, sharing, and discovery. Profile, the center of Facebook since its inception, disappears: it gives way to a timeline, a wire that is "the story of your life," of your last interaction on the social network ... you were born. Nearly a year in October, Apple does preinstalls more Flash on his Mac. A decision that mimicked that of Microsoft Windows, but also followed the passage of arms around Flash iOS between Steve Jobs and Adobe. Hence the subject of this appeal to witnesses who asked the question whether the policy had changed your habits vis-à-vis this plug-in. The answers provided show various positions and trenches and strategies that are just as among those who kept Flash, but want to hold her bridle. Yes to FlashThe reasons are obvious to install Flash. 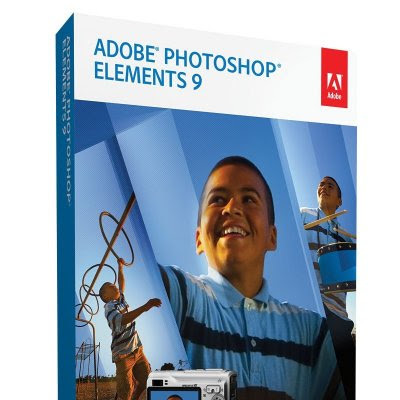 Adobe technology is far from being replaced. Video sites have begun their moult - and yet not all, Canal + has been repeatedly cited as requiring the presence of the plug-in - but many others use it either for promotional content, either through to online tools "I surf more on iPad for some time and we must recognize that many sites require Flash. DIY sites, major retailers of home appliances, computer equipment, etc.. In fact, I will summarize the usefulness of the reader with access to catalogs, the realization of selections or purchases. So back to the iMac ... "wrote wsalado.Same is the ubiquity of Flash with vintz72 "In any new position (PC as Mac), I go very fast in general that he lacks Flash. There is indeed a lot of sites that still use it (partially, but sometimes the whole site is that the Flash). Commercial sites use it extensively (Citroën, Peugeot, etc.. To name brands of cars). Those who say you do not need should not surf much. In short, until everyone has remade its site in HTML5, I must have Flash and I always install. On my iPod touch, I surf few specific apps and make up for the absence. ""I Flash in-dis-pen-sa-ble: I work in photography and graphic design, given the number of photographers Flash websites (including mine), you can not do without. This is the first plug-in installed in Firefox. And that's also why a iPad is irrelevant "says Norbert75. After the Flash users and those who would pass before there is the middle position. That which is to have the plug-in on his machine, but use it sparingly, when you can not do otherwise. "I do not use Flash Player as it slows down too much navigation and is too hot my MacBook Unibody 2008. But I use an extension (ClickToFlash) that allows me to see the contents when needed. ".This use ClickToFlash was mentioned several times. This extension hides the contents of web pages and Flash can play them on demand. You can also choose the sites where ClickToFlash can act and let down in others. "I use ClickToFlash since purchasing my iMac 27" 2009 and before that on my 24 "... 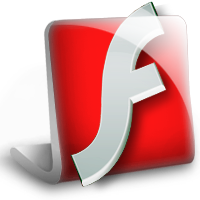 This year, after buying a mini with Leo, the first installation of Flash site met, immediately followed by of ClickToFlash. Contrary to what I read, having lots of RAM (in my case) does not change much, it is mainly the processor that is sought. "Said Ianni.GasyKaManja alternates between two browsers "Mac's Safari or Camino with ClickToFlash with reading Flash blocked by default. I flash to 95% and I do this only when friends send me interesting links: YouTube, Daylimotion, only Flash videos. Or on certain sites only (that of Disney, my bank) or when I have to book or buy something. "The use of a blocker is also highlighted by the older Mac users that the plug-in is broken down.ouviravecAnother solution for Flash without its drawbacks is to enlist the services of Chrome. The plug-in from Adobe is integrated into the Google browser. Therefore one can have a free OS X and Flash for Safari Chrome away when a site or page is needed. The switch from one to the other browsers is even easier. In the Safari menu "Development" contains the command "Open the page" that lists the browsers present. The current page in Safari will automatically be launched Chrome. To enable this menu, go to Safari Preferences and then at the bottom of the panel "Advanced".No FlashThe camp brings together different profiles of refractories. For example owners of older machines somewhat like that of Madalvée "I became a" no flash "in spite of myself on my Power Mac G5 with Tiger, where the software is not updated. Only a few fantasies we are prohibited, such as online shopping site of Adobe (too bad for them) and the sites of those who apply the latest (too bad for them too). The sites of fans who wear a FrontPage design (a web authoring tool from Microsoft, ndr) of the 2000s are still rich and interesting! "There are also Mac users very recent and have not installed the plug-in after purchase "In my case, not at all in Flash for over a year and a half of my machines, including a MacBook Air 2011 "written rom54" and frankly it is rather a big advantage over any pub is almost more than the browser crashes, less consumption for the computer (the fans do take longer depending on the way sites visited by cons ... I installed Java). Ditto for my wife who has turned his cell phone and flash using the Internet to view iPad. Short life without Flash is rather pleasant. "Since moving to Leo, I have not bothered to install flash. He has no real use in certain specific web applications ... that I do not personally. Now, the videos can be played natively, and YouTube (video-only service I use) allows, in its HTML5. "Said MacArthurEU.Another module quoted on a few occasions, one designed for these sites and videos that will force them to play their content in HTML5 with options on the definition used by default. This extension, YouTube5 can work with YouTube, Vimeo and Facebook. The French press powerless against Apple? For these titles, it is not an isolated initiative. 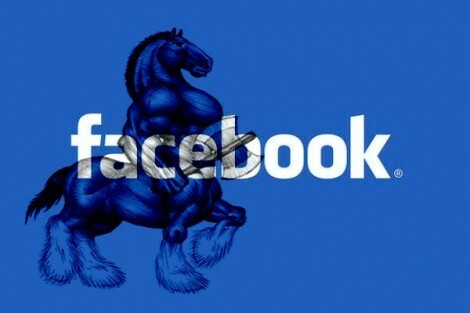 Combined into a single entity, the GIE, they decided to negotiate with one voice against Apple and other Internet giants like Google and Facebook. Speaking with one voice, these media hope to establish a more favorable balance of power and get more favorable terms. In fact, about the kiosk integrated iOS 5, the GIE is clear: the securities in question are planning to boycott as Apple will not make some concessions. It is always the same two points back: the customer files and 30% commission considered too high. Xavier Spender, CEO of Team 24/24, swear that a copy of the newspaper sold on the iPad brings in less money than the paper version. The GIE is of course very attentive to what the other titles to escape the grip of Apple. The initiative of the Financial Times who decided to abandon its application to launch a web solution in HTML5 is followed very closely. In this regard, account Liberation soon launch a webapp to not be dependent on a distributor too powerful. This does not mean that Libé considering stopping development of its applications IOS.Regarding Epress, GIE does not stop there. Subscription offers and bundle will be available in the near future. The various members of the association meet frequently to reflect on how to monetize their content on the Internet. The EIG has already signed an agreement with Google to be present in its booth. Google is far less difficult and greedy Apple. The Internet giant asked a commission of 10% and lends the customer data. On the other hand, newspaper publishers have more flexibility in setting prices. If unity is strength, this group left some observers skeptical. Benedict Evans, an expert on digital content, think the press is in the same situation as the record industry: "People needed the music to Apple, they were not able to negotiate well, unlike the film industry which was able to obtain better deals. The press is desperate, Apple has the advantage. " Ken Doctor, an expert in the media industry for its part provides a different look and feels that this type of coalition has had mixed results in the past. Individual interests often end up taking him as the better of common interests. And that's exactly what happened in the U.S. last year when several newspaper groups have formed a consortium to build a digital kiosk and impose their views. Finally, the union eventually collapse and each actor has signed an agreement directly with Apple ... It should be noted that this association was absent from a brand: Le Monde that he apparently preferred to go it alone. Techcrunch had announced last week the Spartan project, an ambitious project that could allow Apple to compete with Facebook and iOS leaving its own App Store in HTML 5. The site is back on this project, without giving details, but added interesting information about Apple. According to the site, Apple is not afraid Spartan project, on the contrary. The company would provide technical assistance to the social network to help set up his shop dedicated to applications in HTML 5. Two reasons cited by TechCrunch: Apple is not afraid of Web applications offered by Facebook. According to MG Siegler, native applications are much better, and users will no doubt continue to choose them, at least in the majority. Otherwise, this platform encourages developers to abandon the Flash to create applications for Facebook, in favor of HTML 5. Technological change that is not displeasing to a company that puts itself before the HTML 5. Remains that Apple underestimated the impact of a boutique Facebook beyond the control of the App Store, however, says TechCrunch, adding that the project Spartan is causing the delay of the application iPad. If its development has taken so long, it is precisely because the social network wants to make it compatible with Spartan. Face book is apparently going to recruit professionals for its today and tomorrows need for face book mobile application and face book application for Mac and PC. 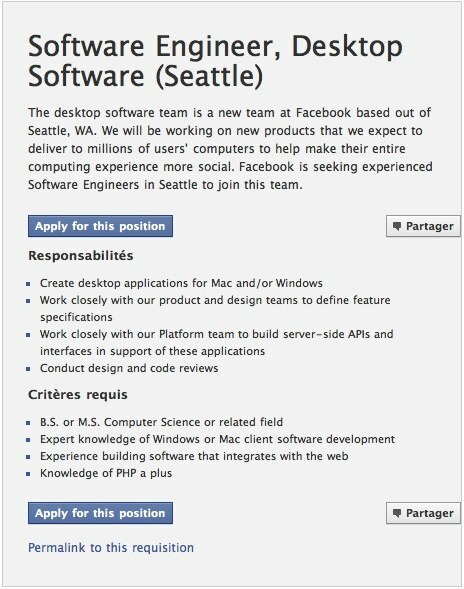 An offer of employment reported by TechCrunch clearly refers to creating applications for Mac and Windows. It does not say much more about the nature of this software, but the announcement about the formation of a new team "Desktop" based in Seattle, responsible for designing new products for the millions of computer user’s social network. 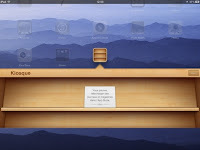 It is also requested that the developer has used to work on Mac or PC client software and integrated with the web. Mac apps for Face book not lacking, especially on the Mac App Store. But many of them are roughly the same, display some content via the web from Face book menu bar or in a dedicated application. 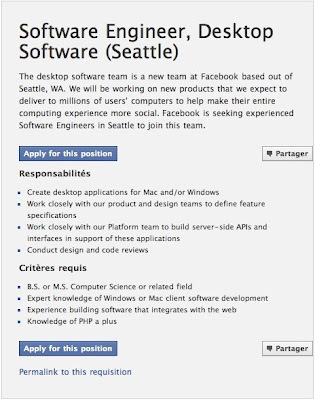 Face book, via two of its developers, has already created a small utility for Mac displaying notifications - Desktop Notifications - but nothing as ambitious as it suggests that this job offer.